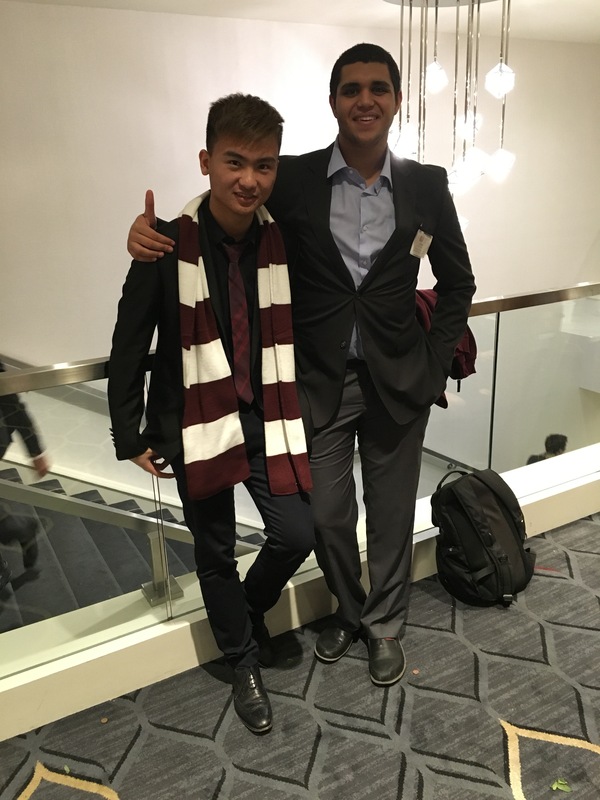 Ivan Pan, left, and Moustafa Elhadary were two of the student delegates who represented Penn State Behrend at the 62nd annual Harvard National Model United Nations. Weibin “Ivan” Pan was optimistic prior to attending the Penn State Behrend Student Leadership Conference in February 2015. The Xiamen, China native had just started his second college semester and was looking to get more involved on campus. But he did more than just get involved. He paved the way for others to get involved, too. “I came out of that conference knowing that I wanted to create a Model United Nations at Penn State Behrend. I was very involved in Model UN in high school, and I knew that a lot of students at Behrend would be interested in the group,” says Pan, a sophomore Finance major. Within a month, he had found a faculty adviser and plenty of interested students. Today, the group, now an official Model UN chapter, has more than 30 members. Pan said a key reason he wanted to start a chapter was to provide opportunities for the college’s growing international student population. Last year, Penn State Behrend welcomed 186 new international students, the largest international class in its history. “Model UN is a great place for international students to practice their public speaking skills, English skills and to learn to negotiate with others,” Pan said. In February, Pan and an additional seven Penn State Behrend student delegates attended the 62nd annual Harvard National Model United Nations (HNMUN). More than 3,000 student delegates from more than 70 countries and 100 universities attended the four-day international relations simulation in downtown Boston. Founded in 1955, the conference is the largest and oldest of its kind, and this year was the first time that Penn State had ever been represented. For the simulation, Pan and the other student delegates (Stephanie Zhao, Naman Tanwar, Tyagadipta Biswal, Deniz Himmetoglu, Hank Pinge, Moustafa Elhadary, and Keshav Prabhu) were assigned the country of Poland. They spent nearly a year researching the country and its policies to prepare for the event. While they did not take home any of the major awards at HNMUN, the team plans to apply to attend the conference next year. The group has also applied to attend the eleventh annual Los Angeles Model United Nations (LAMUN) in April at the University of California, Los Angeles.